The right stone for every job, every material, every finish requirement. Performance-proved on the job. Turn out finer, more uniform work and reduce per-job time with shop-tested Boride Mold and Die Maker Stones. There is a stone designed for every job, every material, every finish requirement. The Boride Product line was planned and developed by mold and die makers for their own use. They are performance-proved on the job. We are confident there is no line as complete or efficient elsewhere, and we invite your own on-the-job comparison to prove it. The use recommendations given here will help you get peak performance from the Boride Products stones you order, and save production time as well. If you have a special finishing job, we invite your request for information. Just give us your work requirements, and we will specify the Boride Products stone or stones to do the job better, faster, easier. The AM-8 is specially engineered for removing the hard scale generated by the EDM process on all types of mold & die steel. The specific qualities of the AM-8 stone make it an excellent tool for polishing sharp corners. Also for small details, hand and especially machine (profiler) finishing. Most polishers prefer to use an oil free lubricant (odorless mineral spirit) when finishing with AM-8 stones. The AM-K series is a white aluminum oxide stone of medium hardness that performs well on all types of mold steel. Generally, this stone can be used "dry" for rough forming and removal of machine marks. Lubricants are used in the finer grit ranges. An excellent (all-around) finishing stone, the AM-2 was engineered for hand polishing all types of mold and die steel grades. These grades include: S A E 1030 tool steel, pre-heat treated P-20 (AISI 4130), H-13, S-7, and T-420. In addition, the soft action, as well as the perfect breakdown of the AM-2, permits pre-finishing on non-ferrous metals such as aluminum, beryllium, kirksite and high chrome/nickel content stainless steel. The use of a lubricant is suggested. Finishing on aluminum, beryllium, kirksite and stain-less steel beyond 320 mesh should be accomplished with Waterproof type abrasive paper. In most instances, use an oil free lubricant agent (odorless mineral spirits). 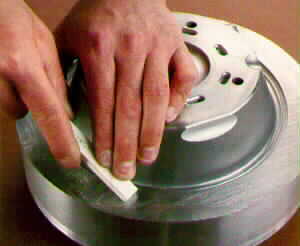 Some expert polishers have claimed that using water when finishing kirksite will generate excellent results. Finishing deep ribbed details and other hard-to-reach corners in a mold requires a special stone with added resilience. The AB series of mold stones feature aluminum oxide Crystals which are uniformly suspended in a resin bonding agent. This special manufacturing process gives the AB mold stone the flex required for finishing those hard-to-reach and small details. The AB series mold stone can be used by hand or with profiler on all mold and die steel, conventional or pre-heat treated quality. The specific type of resin used with the AB-S series makes this stone slightly more resilient than the AB, hence the AB-S stone is also used in deep, hard-to-reach areas. This stone has an added feature in that it generates a softer, finer finish and therefore can be used to enhance surface finishes prior to diamond polishing. The CS is a soft mold stone designed to conform rapidly to a variety of details (shallow radii details or a series of "V" grooves, etc.). The breakdown of this stone is very rapid and therefore it is mostly applied where long stroke hand polishing is required. (As the maximum stroke length of most profiling machines is 1/4 inch, the CS is not recommended for use this way). CS series stones can be used on all tool steels, as well as for roughing out aluminum. beryllium, brass and kirksite. Finish Operations on all extremely high alloy mold and die steel, aluminum, beryllium, brass, kirksite, etc. should be performed with special "wet" abrasive paper only. This stone has a super-fine structure and excellent breakdown properties for final finishing prior to mirror (diamond polished) finishing. The 900 F works especially well on P-20 mold steel with a hardness ranging from 29 to 32 RC. The 900 F is primarily used for hand finishing operations. Always use lubrication with this stone. Copyright (c) Newman Tools Inc.